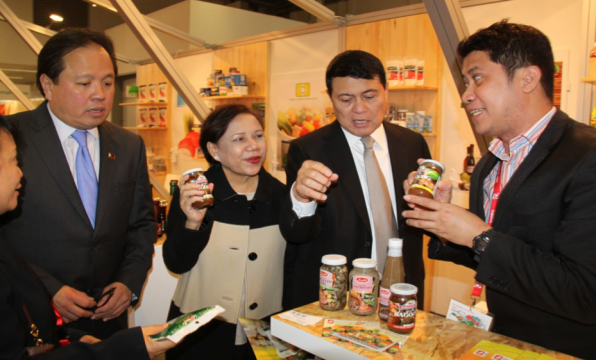 Homegrown Products : Sen. Cynthia Villar(center), chairman of the Senate Committee on Food and Agriculture, listens as Fitrite, Inc. Marketing Manager, Christopher Carillo (right), discusses the global demand for processed marine products at the five-day ANUGA 2013 in Cologne, Germany. The Philippines, through the Department of Trade and Industry, showcased some of the country’s homegrown products which have the potential for market expansion worldwide. With the Senator are former Senate President Manny Villar (secomd from the right) and Trade Undersecretary Ponciano Manalo.